Are you a fan of the finer things in life? Do you dream of diamonds and gold? Hold the Safe is here and it is sure to suit anybody’s palette. This fantastic slot comes from the creatives at Eyecon and is available to play now at Slot Games. Grab your gloves and your safe-cracking kit and get your getaway driver on speed-dial. Vast riches await in the safe. Hold the Safe is a very opulent game with on overarching colour scheme of imperial golds and purples. Everything has been designed to the most exquisite of tastes. 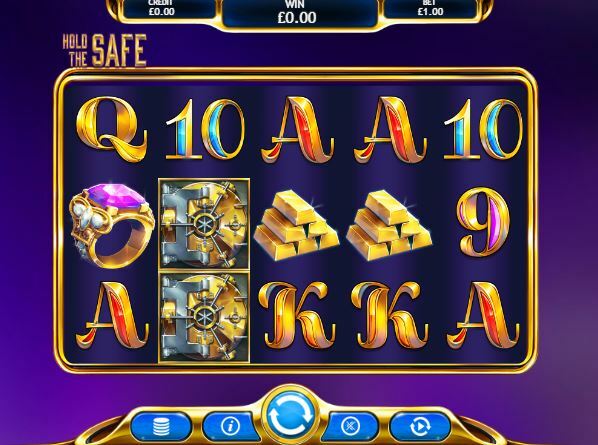 Those well-accustomed to both video slots and casino floors will recognise the bejewelled 9, 10, J, Q, K and A symbols. Of course, that is not all. Hold the Safe also features a selection of bespoke symbols ready to award your efforts; a case stuffed with bills, a bag of priceless diamonds, a tower of gold bullion and an ornamental and heavily bejewelled ring. The crème de la crème of symbols are the wilds and the scatters. Hold the Safe’s wild features golden art deco lettering. One of the scatters is a diamond larger than the Cullinan diamond; sparkling and waiting for you to unlock its mysteries. The other is the golden safe the game is named for; tempting you and begging to be challenged. This slot game is unbelievably simple to play and perfect for anyone who enjoys slots without crazy graphics and bonus mechanics. Everything you require is on the game screen before you. Bet adjustments are made through the pop-up table on your right below the spin button. Simply click the stack of coins icon and adjust the slider so you are wagering as little or as much as you feel comfortable doing. Above the spinner lies the autoplay. Choosing from amongst the preset options allows players with other pursuits to venture away content in the knowledge that their game is safe. Have no fear, in the event of the bonus game, your autospins will halt. Hold the Safe features 25 paylines for you to take advantage of. You only need a combo of 3 or more symbols to win putting you in an excellent position to grab that jackpot. There are of course some lucrative bonus features to keep you entertained beyond the base game. Remember those glittering diamonds? Collect 3 during your gameplay and you will be awarded 3 bonus spins; a switch not even the most veteran of security guards will notice. The greatest prize of all lies within the Hold the Safe bonus game. When you catch 3 of the golden safe scatters across the board, you will be quickly escorted into the minigame. The 5 reels swiftly turn into 15 and you are handed 3 free spins. You could cut the tension with a knife as you press the spinner and wait to see if you can grab any more safes. Don’t worry, the ones you already have will stay put and your free spins are renewed for every new safe you find. Either you will grab all 15 available safes or you will run out of spins. Then, wait to see what riches lie within and how much you have managed to score. Cracking a safe has never been easier. To pull off a heist that will make the greatest of mobsters weep with envy, try Hold the Safe today!